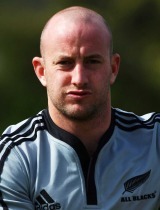 Brendon Leonard is a New Zealand scrum-half who made his All Blacks debut after one season of Super 14 rugby. Leonard's opportunistic play for the Chiefs earned him a call-up to the Test side and he made his Test debut in 2007 against France in Auckland. In 2007 Leonard was selected in the All Blacks World Cup squad and played as a replacement in the shock quarter-final defeat to France in Cardiff. Leonard is the son of former Waikato player, Ron.